The World Cup - With the World Cup beginning on June 12, 2014 and running through the championship game on July 13, 2014 in Brazil, we present here stamps that trace the history of this worldwide event from the first, 1930, competition to date. Click here or the Browsing the Web button to your left for the complete World Cup article! 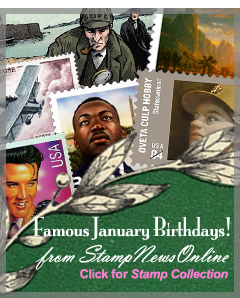 If you have enjoyed this issue of Stamp News Online, Subcribe Now and receive 12 issues for just $9. Thank you!